If it’s one thing we should all do as soon as possible, that is to look after our skin. I really started paying attention to this in my 30’s, but really, when I was partying and enjoying life in my 20’s with gorgeous smooth skin, that is when I really should have started putting the effort in. It’s never too late to start though! What you put on your skin is important. It is the largest organ in your body, and if you look after it and treat it well, it will serve you fabulously for years to come. There are so many skin care brands out there on the market, how do you know which one to go for? My recommendation is primarily to go for a skincare range that labels itself as a cosmeceutical and that is backed by science. The reason I say this is that cosmeceuticals contain high strength concentrations of the vitamins and active compounds that work on your skin to make it glow and keep away the wrinkles. Do your research on any range you choose to go for and try a few different brands to see what suits you. It is the Vitamin A component of your skincare that will provide the real kick in terms of anti-ageing effects. Vitamin A stimulates collagen synthesis and increases cell turn-over of your top skin layer. The result is a reduction in fine lines and wrinkles and smooth, blemish-free skin. No anti-ageing regime is complete with a dose of Vitamin A. Usually it is applied at night time. Now there can be a downside to high strength Vitamin A preparations, they have side effects. The main side effects are redness, irritation and peeling of the skin, which is temporary until your skin gets used to the formula. In fact the world’s highest strength vitamin A cream, is a prescription only medication which is actually used for acne treatment. It is great for anti-ageing however it has side effects. Generally speaking I only prescribe this when my patients are wanting more of a hit in the Vitamin A department than they are getting with their cosmeceutical products. Vitamin A preparations go by the name of Retinol, Pro-retinol, retinoic Acid and Retinaldehyde. Getting your daily dose of Vitamin B is an essential part of your skin routine. The B Vitamins are actually a collection of vitamins that all do great things, the most important of which for skin are Vitamin B3 (niacinamide) and Panthenol, also known as Provitamin B5. It is a great hydrator and collagen booster so it reduces the appearace of fine lines and wrinkles, giving skin a lovely luminoscity. It has powerful anti-inflammatory effects and healing effects, thus works to calm reduce redness and blemishes, such as with problematic skin with acne or rosacea. It regulates sebum production so refines pore size. It gives your skin’s immunity a boost and stregthens your skin barrier. It works as a booster to other skincare products too, namely Vitamin A. Vitamin B is a twice daily part of my skincare regime. Vitamin C packs a punch in skin care. Its a powerful anti-oxidant that protects the skin from anti-oxidants, including from the sun’s UVA and UVB rays and shielding you from pollution. If there is any damage on your skin, it helps to reduce redness and speed up the body’s natural healing processes making it great for areas where there are small cuts, acne scars, sunburn and other blemishes. It aids collagen production by boosting skin fibroblasts which softens any fine lines on the face. It also helps to improve hydration, brighten your skin and even out skin tone. One area where this is particularly effective is in the under-eye circles where it brighten’s up the dullness you get from tired eyes. Overall it makes your skin shine and makes you look younger. Okay, I admit. This is the odd one out. You don’t apply Vitamin D to your skin in cream form, our main source of vitamin D is from the sun. However Vitamin D is relevant to our skin. We all need a little dose of sunshine to get our Vitamin D to keep our body’s healthy, however too much exposure to the sun and it accelerate skin ageing. So when you think Vitamin D, think sun protection on your face. It is a fine balance though. Vitamin D is the feel good vitamin and every cell in your body needs it to stay healthy. It aids skin growth, repair and metabolism, it fights free radicals and it boosts your immune system. Vitamin E is found in so many skincare products because it is so versatile and highly beneficial for the skin. Its a great moisturiser and good for dry, rough skin. It is an anti-oxidant and protects your skin against environmental damage whilst enhancing your immune response. It also encourages the healthy growth of new skin cells and boosts collagen production. For that reason it lightens scars and can be good for stretch marks. Vitamin E also works well in conjunction with other products, namely Vitamin C and Co-enzyme Q10. As well as applying Vitamin E to your face it is also an effective treatment for wrinkles. In its purest form, you can either apply it to your skin or swallow it in a capsule. 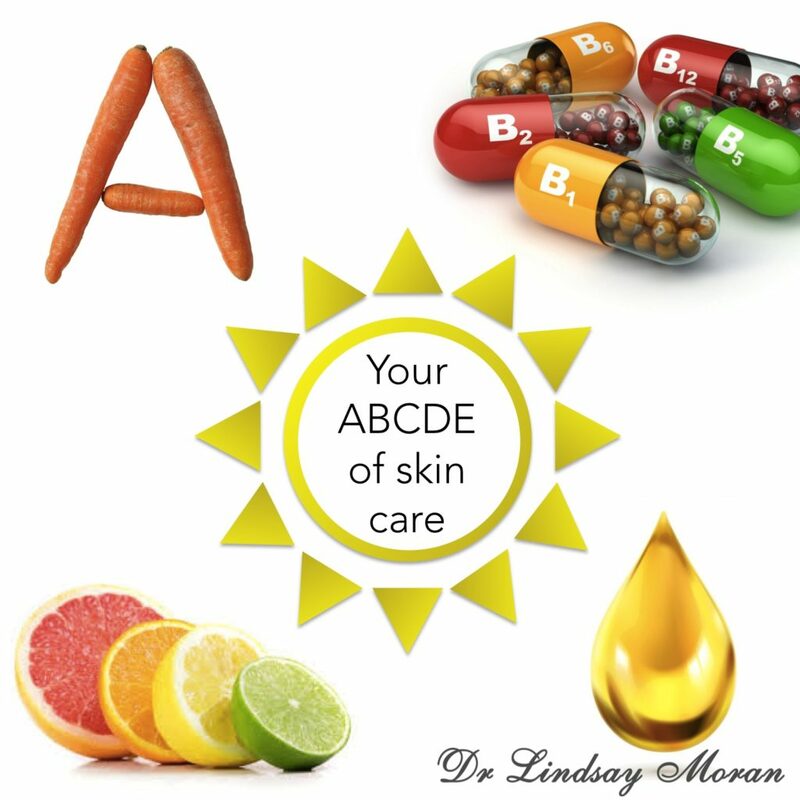 So there we have it, the ABCDE of skin care. The best time to start caring about what you put on your face is now. I recommend to find a brand that you like and that uses high strength active ingredients. When you get a good routine going your skin will look healthy, young and luminous.